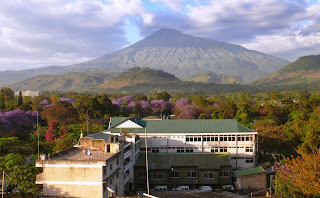 The purple blossoms of the jacaranda tree are everywhere this time of year in Arusha, Tanzania. It made us feel right at home, since there was a jacaranda tree right outside our house in the Central African Republic (CAR) and there are jacaranda trees in Puerto Rico, too (where we lived before coming to Africa seven years ago). After a sad farewell to CAR this past summer, we have re-located in Tanzania, and are beginning our work as the East Africa Regional Representatives for the Evangelical Lutheran Church in America (ELCA). Our job is to accompany the national Lutheran Churches and assist them with projects in Kenya, Madagascar, Rwanda, Tanzania, and Uganda. These projects include agriculture, education, health care, theological education, development (including providing safe water), and much more. The areas where we will be working include everything from desert to tropical rainforest, from coastal to inland plains, lakes and mountains. We look forward to getting to know this part of the world and to making new friends. We will share our adventures with you on this blog, and highlight the work of some people who are really making a difference in East Africa. This is an exciting time to be working in Africa. Churches here are growing faster than in almost any other part of the world; there are even more Lutherans in Tanzania than in the ELCA! Working through churches is also one of the best ways to make lasting changes, since the church will still be here long after we are gone—and the people who have been trained will train others. Photo Credit: Jacaranda trees with Mt. Meru in the distance. Photo by John Schwegman.